Kimber's Crimson Carry II is street ready right out of the box. Kimber raised a lot of eyebrows in the mid-1990s when it started offering fully-loaded 1911s at a price most shooters could afford. For the first time, shooters could get a 1911 with custom features such as good sights, a crisp trigger and a match-grade barrel without sending their gun off to a big-name pistolsmith and spending hundreds or even thousands of dollars to get the 1911 they wanted. Not surprisingly, Kimber sold a lot of them, and the list of available models grew along with the company. Now Kimber has raised the bar with the Crimson Carry II. The gun in Custom guise is a full-size, aluminum-frame 1911 (smaller Pro and Ultra versions are also available), but its distinguishing feature is the Crimson Trace grips. The grips on the Kimber Crimson Carry II are made exclusively for this pistol. They are a high-impact polymer material with an attractive rosewood finish--with the exception of a small section of soft, black rubber that wraps around the front strap just below the trigger guard. The rubber section houses the unit's momentary-on pressure switch, but it also gives a bit more traction on the front strap for the middle finger. A master power switch at the bottom of the left grip panel gives users the option of disabling the laser. The matte black steel slide has rear and forward cocking serrations and houses a five-inch, stainless steel match barrel and a full-length guide rod. The rear of the ejection port is relieved, and a notch in the barrel serves as a loaded chamber indicator. The sights are Kimber's classic, low-profile, snag-free design. Their faces are black and serrated, in keeping with the overall no-nonsense design of this gun. The heart of the Crimson Carry II is, of course, the Crimson Trace laser grips, tastefully designed with a rosewood finish. The soft black rubber section houses the activation switch. The Crimson Carry II's thumb safety and slide release are slightly over-size for ease of use, but aren't so big they get in the way. Kimber's low-profile, snag-free rear sight is one of the author's favorites, although even with the laser grips he wishes it were a night sight. As mentioned, the Crimson Carry II's frame is aluminum. For some reason, aluminum-framed, full-size 1911s have never been very popular. But seeing as how carry guns are meant to be, well, carried and five-inch guns are the most reliable members of the 1911 clan, a full-length slide on a lightweight frame has always made sense to me. The frame is finished in a matte sliver, providing an attractive contrast to the black slide. The front strap is smooth, but the hard polymer mainspring housing has molded-in checkering. Other frame-mounted features include an extended magazine release; a checkered slide release; an extended, three-hole aluminum trigger; a Commander-style hammer; an extended, tactical-style thumb safety; and a nicely fitted beavertail grip safety. A carry bevel package, which extends to the magazine well, is also standard. 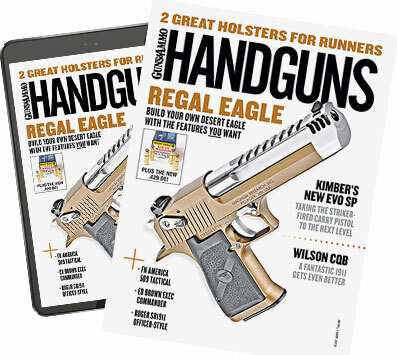 The above-mentioned features pretty much cover all the 1911 "must-haves." But the lack of a checkered front strap and night sights might leave some shooters nonplussed, despite the fact that skipping those features helps keep the suggested retail price down. More on this later. The pistol's lightweight frame makes it perfectly suitable for daily carry, and the laser grips make it an ideal fighting tool in any light. I was quite impressed with the new Kimber when I took it out of the box. Fit and finish were very good, with minimal play between the slide and frame. The slide reciprocated smoothly on the frame rails, and the barrel was fitted just right. The trigger, which is user-adjustable for overtravel, was pretty clean for a factory gun. It required 5.25 pounds to trip the sear but was clean enough that my guess was a half-pound less. All the controls worked smoothly and positively. The safety went on and off with a tactile and audible "click," and the grip safety was easy to engage. The small shelf on the slide release was a nice touch, as was the slightly extended magazine release. I am no fan of oversize, match-style parts on carry guns as they are too easy to engage inadvertently. But the Kimber's controls are just big enough to make them easy to use while still small enough that I don't fear ejecting a loaded magazine or locking the slide back mid-fight. Sights: low-profile front and rear; Crimson Trace laser grips. The Crimson Carry wears the II designation, which means it has Kimber's Series II firing pin safety. Unlike other systems that work against the trigger, the Series II system is activated by the grip safety. Squeezing the grip safety with your normal firing grip raises a bar that raises the firing pin block so the firing pin can move forward when the trigger is pulled. If properly timed, this system works well, although I prefer Kimber's Series I guns, which are basically Series 70-style pistols. The sights are black and serrated, with no white dots or tritium inserts. Truth be told, I like that setup for daylight shooting, though it is not high on my list for a defensive pistol. But the included Crimson Trace laser grips more than make up for this. The laser must have been zeroed at the factory; the red dot sat right on top of my front sight when I checked it out on my living room wall. Disassembling the pistol for cleaning was a snap, although its full-length guide rod means you'll need a bushing wrench to get it apart. I checked the internal parts during my pre-range cleaning session and found everything satisfactory. Then it was off to the range to see how it performed. I took an assortment of ammunition from Black Hills, Cor-Bon, Federal, Hornady and Winchester, plus a dozen magazines from Wilson Combat and Chip McCormick. As is my custom, I started my testing up close to get a feel for the trigger, verify zero and make sure the pistol functions properly. In this case, the Kimber Crimson Carry II fed smoothly, fired every time I pulled the trigger and ejected empties smartly. The trigger felt as good on the range as it did in my dry fire practice, and 230-grain FMJs hit right behind the front sight or a half-inch or so below the laser. I ended up firing about 150 rounds before a summer storm blew in and ended my range session. I began my second session at the 25-yard line, where I tested the Kimber's accuracy with six loads over a sandbag rest. I alternated between the sights and the laser, firing three groups each way and using the average. However, I actually preferred the sights for precision work because my wiggles and tremors were not nearly as noticeable as they were with the laser. The top group (Hornady's 200-grain XTP) measured 1.13 inches and the bottom (Federal's 230-grain Hydra-Shok) 1.24 inches--he excellent accuracy you expect from Kimber. As you can see in the accompanying table, accuracy was quite impressive with both sighting systems. Two loads averaged under two inches for six five-shot groups, and even the worst load averaged under three inches--pretty darn good for a production pistol of any type or price at 25 yards. With the accuracy work out of the way, I went back to the seven-yard line for a bit of speed work. I started out with double taps to get a feel for the gun, then progressed to failure-to-stop drills. That exercise gobbled up 150 rounds of ammunition, but I still had 200 rounds left, so I loaded up all my magazines and proceeded to empty them as fast as I could find the sights. Through it all, the pistol performed without a hiccup. I can't say I was surprised by my test results. As with most of the Kimber pistols I've shot over the last decade, the Crimson Carry was accurate and reliable. What did surprise me a bit, however, was how controllable it was considering that it lacks checkering and weighs almost a half-pound less than a steel-framed 1911. Notes:Accuracy is average of six five-shot groups fired at 25 yards from a sandbag rest. Velocity is the average of 20 rounds measured 10 feet from the muzzle on a Shooting Chrony. I am so used to checkering on my 1911s that I feared the gun would slide around in my hand a whole lot more in the extreme Texas heat. It did slip a bit, but not until I was well into an extended firing string. In the real world, few shooters would ever notice the lack of checkering. The controllability of the alloy-framed pistol was also a nice surprise. As I said earlier, the lightweight frame is the bee's knees for everyday carry, although lightweight guns are known for having a bit more recoil. But because that five-inch slide hangs out there a bit, I didn't notice an appreciable increase in muzzle rise. Your mileage may vary, but a slightly slower shot-to-shot recovery time is, in my opinion, outweighed by the nearly half-pound weight savings the alloy frame offers. After looking back at my notes and targets and taking one last, hard look at the gun that sits on my desk as I write this, I couldn't find a thing not to like about the Crimson Carry II. Though I'd like to see front-strap checkering and night sights just in case, the price would have to go up. And that would negate one of this gun's biggest assets: its suggested retail of $1,046, Crimson Trace laser grips and all. Its high quality, low price and impressive standard features combine to make the new Kimber one of the most noteworthy 1911 introductions I've seen in a long time.